Born: 27 April 1896 in Burlington, Ohio. Died: 29 April 1937 in Philadelphia. Wallace Carothers deserves a double credit in the history of polymers since not only did his team at DuPont develop the first commercial synthetic elastomer, which is still commercially and technically important today, but also, a few years later, he was responsible for the discovery of arguably one of the greatest families of plastics ever commercialised. He was born on April 27th 1896, the eldest of four children, in Burlington, Ohio. He was considered ‘bookish’ at school but that was to underestimate his breadth of interests. As well as devouring every book he could get hold of he was fascinated by mechanical toys and he loved music, his tastes ranging from Bach to Gilbert and Sullivan. In high school his interests turned to chemistry and he built a laboratory in his bedroom. His father taught at Capital City Commercial College in Des Moines and it was here that Carothers went to study accounting when he left school. He then moved to Tarkio College in Missouri to study chemistry although, being short of funds, he used his accounting learning to advantage by teaching it in his spare time! He must have been a remarkable student – possibly unique - because he was made head of the chemistry department WHILST STILL AN UNDERGRADUATE. He graduated in 1920, obtained his Masters in 1921 and his Doctorate from the University of Illinois in 1924. He was then appointed a professor at Harvard where he began his serious research career into high polymers. It was during his time in Illinois that the tormented side of Carothers’ character surfaced when he filled a phial with cyanide, to be carried with him for the rest of his life as an escape route if his fits of depression became too much to bear. In 1928 DuPont broke new ground by setting aside a laboratory for pure research. The ‘Blue Skies’ approach is not unusual today but at that time corporate research was very much ‘cashflow oriented’. The chance to forgo teaching and devote all his time to research was not to be missed and, at 32, he was placed in charge of DuPont’s research division. 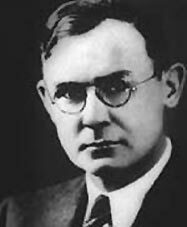 It was known that he suffered from moods of deep depression and his staff was warned to look out for them but his mentor, Roger Adams, believed that these could be controlled and that Carothers had much to give the world from his researches. He was half right! Dupont was aware of the work of Father Julius Nieuwland into the synthesis of chloroprene from acetylene and believed that this could be the precursor of a viable synthetic elastomer (chloroprene has a molecular structure which can be described as that of isoprene [the building block of natural rubber] with its branched methyl group replaced by a chlorine atom). This became Carothers’ first project and in April 1930 the polymer was synthesised by one of his team, Arnold Collins. This had the anticipated ‘rubbery’ properties and whilst these were somewhat poorer than those exhibited by natural rubber in many areas it had a much greater oil resistance. This gave it a niche market and it went into production in 1931 as Neoprene, the first commercially successful synthetic polymer which is still in production today. The chemical name for the elastomer is polychloroprene, Neoprene being DuPont’s trade name, but, like Hoover, the word has now been accepted as generic. With that problem quickly resolved (three years from start of research to commercial production!) Carothers’ group turned its attention to synthetic fibres, specifically to find a replacement for silk which was in short supply because of trade and political problems between the USA and Japan. He had postulated some years earlier that if an acid and alcohol could condense, with the elimination of water, to produce an ester, it should be possible to make a giant molecule (polymer) by linking diols to diesters. This was soon achieved by one of his team, Julian Hill, to give an early polyester but the physical properties were too poor for commercialisation and Carothers turned his attentions to polyamides, replacing the diols with diamines. In 1934 the first successful fibres were made. Carothers’ team was working with over 100 different materials and he identified them by two numbers, indicating the number of carbon atoms in the diacid and diamine. In February 1935 he polymerised adipic acid (C6) and hexamethylene diamine (C6) to give specimen 66 which had good physical properties when it was drawn into a fibre. The material was christened Tiber 66 and, in September 1938 re-christened Nylon66. In three years of research Carothers’ team had created the first commercial synthetic rubber with the discovery of neoprene and now they had done it in the plastics field with nylon. Carothers’ immediate superior decided to hit one market with this new product and in May 1940 nylon stockings hit the hosiery stores nationwide. At just over one dollar a pair, five million pairs were sold on the first day. When the States entered the Second World War and arrived in the UK, a few pairs of nylons could buy anything! By that time however, production of nylon had been directed towards the war effort, particularly parachute canopies, rot-proof cords and life rafts and the ladies had to wait a few more years to have an unlimited supply of seamless or fully fashioned nylon stockings. The research work of Carothers and his team changed the world but he couldn’t cope with it even as it was and he never knew what he had achieved. His earlier bouts of depression and heavy drinking had destabilised him. He grew up in a very close relationship with his sister, Isobel, and then fell in love with a married woman but, when she became available, he retreated to his parents’ house. He spent time in a psychiatric hospital and was advised to marry by his doctor. In January 1936 his sister died and soon after he married Helen Sweetman, a co-worker at DuPont. She and DuPont rapidly agreed that he needed hospitalisation and after some treatment he was released to take a walking holiday in the Alps with his old friend Roger Adams. According to Adams he seemed to improve during this time but relapsed on his return to the US even though he was actively cared for by his wife, psychiatrist, friends and colleagues. In the middle of April 1937 Helen told him that she was pregnant and on April 29th of that year, alone in a hotel in Philadelphia, he cracked open his phial of cyanide and died believing that he was ‘morally bankrupt’ and that his work had been useless. Helen later gave birth to a daughter, Jane.